...is the reason for the hiatus in blog posts. I have been ploughing through our accounts, diligently entering all our invoices into the accounting system. A lot of invoices, but fortunately, the expenditure is pretty close to budget - we have pinned down most of the costs and have avoided or covered most opportunities for nasty surprises, and are only about 3% over budget, well within our contingency. This is a pleasant surprise, and one I take no pride in, as we all know what comes before a fall. This is all happening on our dining table, so no food for about a week or so. The little ones are taking this reasonably well, and for us biggies - well, I am thinking of writing "The Book-keepers Diet" - should be a nice little earner on the side. Just a public service announcement, really. 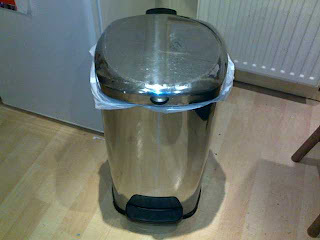 My multi-tasking motor broke down the other day while trying to track one too many urgent tasks, and I found I was about to relieve myself into our flip-top kitchen bin. Fortunately I caught myself* before the moment of crisis - and yes I was entirely sober. Perhaps I should have had a beer for breakfast. * : Not in the zip. Finishing off the tiling : coving formed by hand between the tiles and bunding, then epoxy grout, and finally sand. Looks handsome, feels solid. This will be our delivery vehicle for the short term. 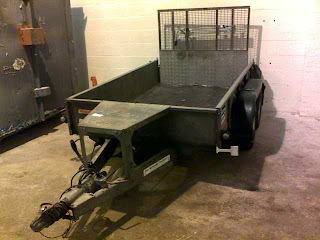 More affordable than a van, but a bugger to reverse - straight-ahead deliveries only. We shall try to tart up the livery a bit. First the bund wall formed from kerb stones : wet the floor with glue, thin layer of cement, screed (cement & sand) bed, another thin layer of cement, lay kerb stones & mortar - all done with care and precision. Our floor slopes a little, and as the bund is true to horizontal, the difference in screed depth between the downhill and uphill ends is very noticeable. 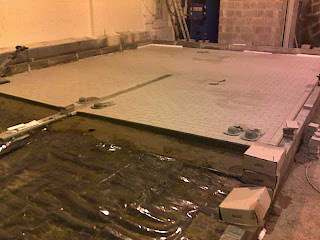 The next day the screed for the tiles goes in, on top of a layer of polythene - a "floating" flloor that will tolerate some movement in the underlying slab. 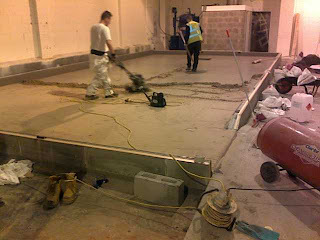 The screed is laid to fall from the kerb stones to the central surface drain - skillful work. Expanded polystyrene between the fixed components (drainage channel, bund, etc.) and the screed allows for differential thermal expansion. Half the tiles has been laid, again on a thin layer of concrete above the screed, and again with care and attention to detail. Next the tiles are vibrated down, swept with sand to fill the gaps, and finished with epoxy grout. Should be finished tomorr... err... today. As the main water pipe was in the way (only about 40 cm. off the floor), we had to move it, by the simple expedient of four-and-a-half people and a fork lift raising a 23 meter copper pipe 2 meters up the wall. Only one break, and that easily repaired. I was expecting much trauma, but had to make do with anti-climax. The pipe now runs along the wall at about 2.5 metres (these two pictures taken from the balcony above the office); we used spare MDPE (blue plastic) pipe for the vertical section. 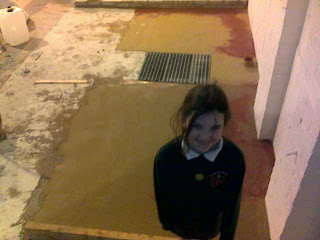 Much of the floor in this photograph should be tiled by the end of the week. Rated : Quite Exciting.